My husband is the culinary master and I pretend to play sous chef while my daughters are being brought up to love and appreciate food. I’ve come a long way from eating whatever was on sale many moons ago in southeastern Ohio to dining at Dai Due in Austin for the sheer fun of it. Somewhere along the way, food became more of an experience and less of a need to simply satiate my hunger pains. I started reading cook books – gasp!- for the pleasure of understanding dishes and there are times I feel like I am talking Greek to my mom when I’m simply explaining a meal we created for the girls. So, when I saw a fantastic foodie coloring and activity book for families like ours by Andre Hueston Mack, I knew that it would be a huge hit for my husband and oldest daughter – who is becoming quite a little chef in her own right. Andre Hueston Mack is the owner and winemaker of Mouton Noir (translation: Black Sheep) Wines who is also the creative designer behind Small Thyme Cooks. In fact, Mack, who is based out of Brooklyn, has an entire creative agency that focuses on gourmet design called Get Fraîche Cru. Brilliant, huh? What I love about this coloring and activity book is that it isn’t just for those who are chefs, it truly is a fun way for anyone to explore more about the culinary arts; from breaking down a hog to knowing the parts of a knife. Brooke got a kick out of activities like the mushroom word search and a maze about bringing farm-to-table while Bob and I laughed at how clever the concept is and how we wished we would have thought of Small Thyme Cooks first. 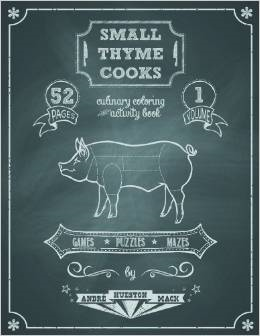 Plus, who doesn’t love a book aimed at kids with such featured chefs as Anthony Bourdain and Wylie Dusfresne? We are excited to see that Small Thyme Cooks is just Volume One of what will hopefully be a continuing series of culinary love and tidbits for kiddos. We can’t all grow up on charcuterie and stinky cheese, but that doesn’t mean our kiddos have to be deprived of such delicacies now that we know better! Bon appétit mon bébé. Charity! Part of the proceeds of this book go to the Charlie Trotter Culinary Foundation that provides scholarships and mentoring to young people interested in food-related careers. Nice.